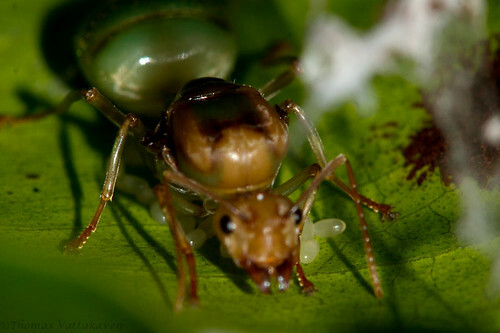 In all the time, I`ve been familiar with weaver ants, I`ve never quite seen the queen properly, that is, until today. I was photographing the scorpion-like spider that I posted yesterday, when I came across two leaves woven into a nest of some kind. I managed to align my flash to light up the interior of the nest through the slit like opening and cooped up inside was this weaver ant queen. At first I didn’t notice the eggs but a closer look revealed a bunch of eggs which the queen was faithfully brooding. Perhaps tending to is a better term to use. 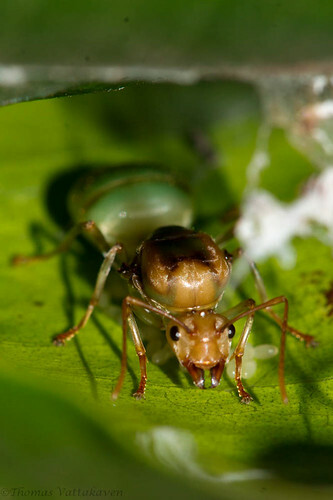 A queen ant is the egg layer in the ant colony. It all starts when the ants have their mating flight. The queen ant mates with a male ant, often in a mid air courtship flight. During this, the male transfers sperm to the seminal receptacle of the queen and then dies. 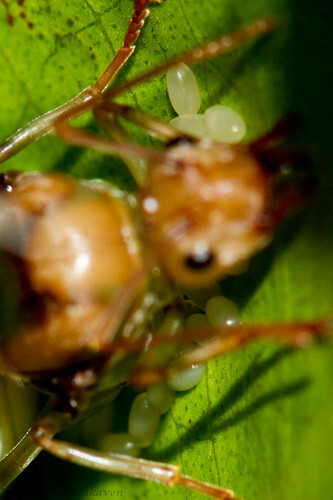 The queen then returns to land, loses her wings and finds a safe place to lay her eggs. 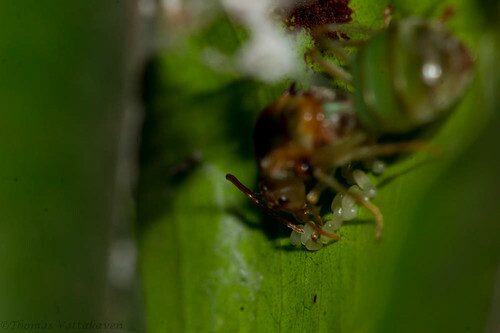 In this case, she built a miniature nest between two leaves, bound with ant-silk. She then lays her eggs and looks after them until they hatch. 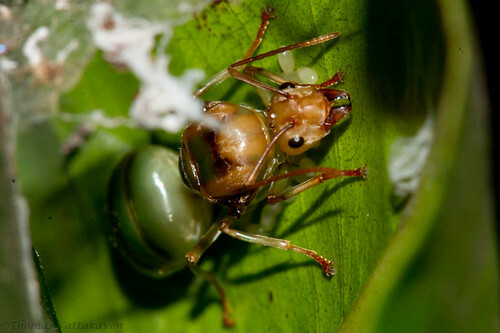 This is a one –time job, since after the worker ants hatch, they will then look after her and all future eggs. The eggs go through four stages egg>larvae> pupae > adult. As the workers increase, the colony will expand, they will build themselves a larger nest and take over the tree in which the queen has built her nest. 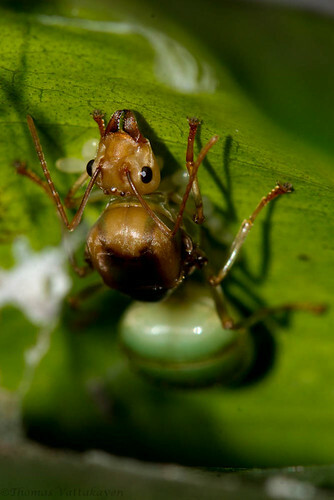 I`ve always wondered how the weaver ants take over new trees and could only imagine ants moving from one colony to another tree and establishing themselves there. I never thought of a queen starting a fresh colony on a new tree. I hope to keep tack of this new colony as it develops and hopefully catalogue its progress here.